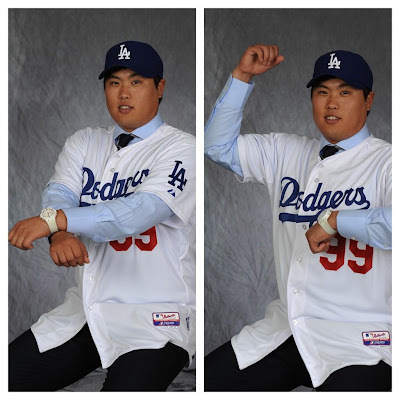 First of all, I wanted to start by announcing that the Dodgers are holding a meet and greet with Hyun-Jin Ryu and the Korean community tomorrow afternoon. It will be from 12:00 PM to 1:00 PM at the front plaza of the Wilshire Park Place/Radio Korea Building at 3700 Wilshire Boulevard. (between Oxford and Serrano, east of Western Avenue) See more information here. As you probably know, the Dodgers held a press conference this afternoon to formally introduce Hyun-Jin Ryu to the masses. It was part photo opportunity, part PR blitz complete with the very first real Ryu Baseball card (as opposed to my fake fantasy cards I make on photoshop). 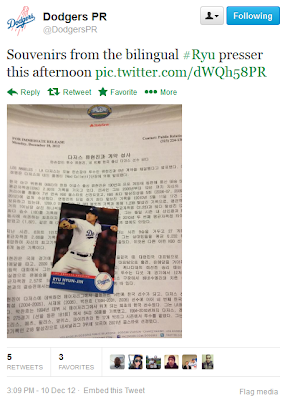 Check out the pic below tweeted by the Dodgers PR department. They apparently handed out the card to attendees. Just before they took the stage, Ned Colletti, Scott Boras, and another unknown person gathered around Ryu as he signed the contract. Pic via @Dodgers on twitter. 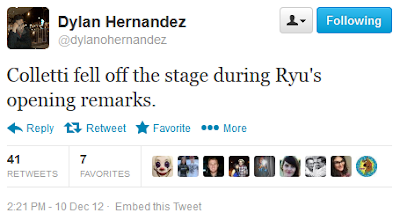 Then, they brought Ryu to the stage in front of a legion of reporters. He put on the uniform and gave some informal remarks. Somewhere in the middle, Ned Colletti did a belly flop off the stage. I like to imagine that it was a glorious crash with mangled bodies and the sound of a loud thud to accentuate the situation. Instead, it was likely a little trip that apparently wasn't recorded for our viewing pleasure. 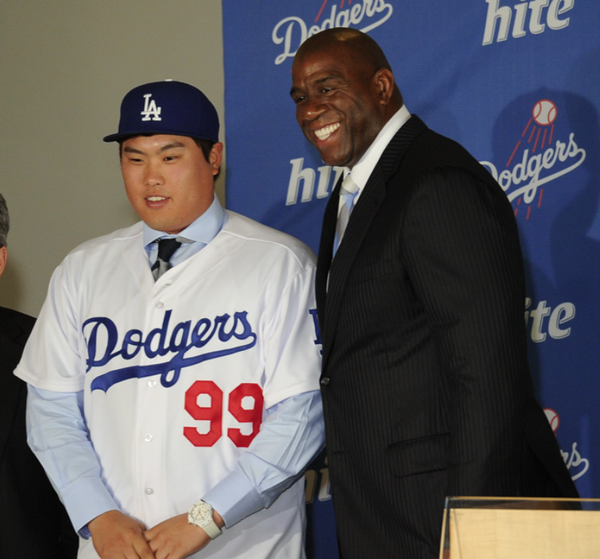 One great bit of levity was when Magic Johnson blurted out a response to Ryu when he mentioned that he hopes to learn English soon so he can communicate with his teammates. BTW, you can see a bunch of pics from Roberto at Vin Scully is My Homeboy. Also, watch a bit of the press conference below. Oh... One other thing. The Dodgers tweeted the below pic of Ryu doing the "Gangnam Style" dance. I'm both embarrassed and giddy about it. After all, I refuse to believe that Gangnam Style is out of style. It's Official. Zach Greinke is a Dodger! The Dodgers have officially made Zach Greinke a member of the Dodgers. Woo Hoo! LOS ANGELES – The Los Angeles Dodgers today announced the signing of right-handed pitcher Zack Greinke to a six-year contract. The announcement was made by Dodger General Manager Ned Colletti. 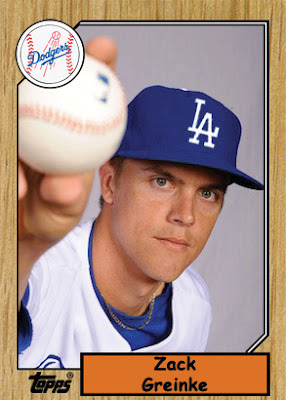 Greinke, 29, will enter his 10th Major League season in 2013 after pitching for the Royals (2004-10), Brewers (2011-12) and Angels (2012) during the course of his career. He went a combined 15-5 with 3.48 ERA in 34 starts for the Brewers and Angels last season and finished the campaign on a five-game winning streak, going 5-0 with a 2.04 ERA (13 ER/57.1 IP) in his last eight starts after Aug. 24. In 2011, his only full season in the National League, Greinke tied a career high with 16 wins and his .738 winning percentage (31-11) in 62 starts during the last two seasons ranks third in the Majors, trailing only Justin Verlander (.759) and Jered Weaver (.745). Greinke is one of just 13 Major League pitchers to reach 400 strikeouts (401) since the start of the 2011 campaign and has averaged 9.40 strikeouts per 9.0 innings in that span, the sixth-best mark in the Majors. In 2009 with the Royals, Greinke won the American League Cy Young Award by a wide margin after going 16-8 with a Major League-best 2.16 ERA. That season, he was named to the AL All-Star team and ranked among the big league leaders in quality starts (26, T-2nd), complete games (6, T-2nd), shutouts (3, 2nd) and strikeouts (242, 3rd). All of those numbers represent career bests. The 6-foot-2, 200-pounder is 91-78 (.538) with a 3.77 ERA in 272 career games (231 starts) and has posted double-digit wins in five consecutive seasons, ranking among the Major League leaders in wins (70, T-8th), strikeouts (1007, 5th) and quality starts (109, 10th) since 2008. During the course of his career, Greinke has been tough against right-handed hitters, limiting them to a .244 batting average, a .291 on-base percentage and a .373 slugging percentage. 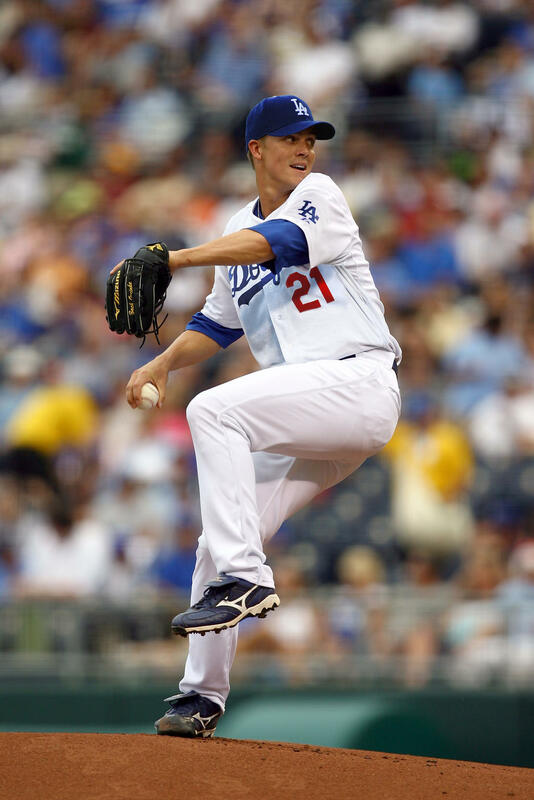 In the field, Greinke has not committed an error since July 16, 2010, a span of 76 games, and posted a .984 career fielding percentage, which is the eighth-best mark among pitchers since 2004. 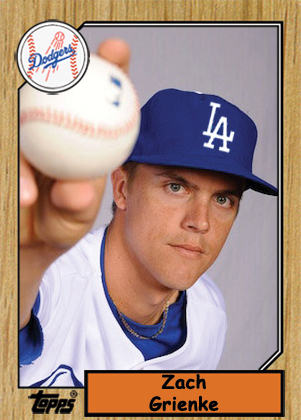 Greinke is a native of Orlando, FL, and he was selected in the first round (sixth overall) of the 2002 First-Year Player Draft by Kansas City out of Apopka (FL) High School. He was named the Gatorade National Baseball Player of the Year following his senior season, when he went 9-2 with a 0.55 ERA (4 ER/65.0 IP) and 118 strikeouts. Greinke and his wife, Emily, make their home in Orlando, FL. Yesterday, I posted up a card creation I made of Zach Greinke on a 1987 Topps Baseball card, and was so smitten with myself I had to let everyone know how much I liked it. Well, imagine my embarrassment when I realized I made a glaringly obvious mistake. Thanks to Fernando, I shall never forget. Worse yet, I apparently misspelled his name at least 10 times on this blog. My "red face" is just now starting to fade. Now I know how the Baseball card manufacturers feel when they screw up something so easy. In hopes of redeeming myself, below is the "correct" version. I wonder which one is more rare? 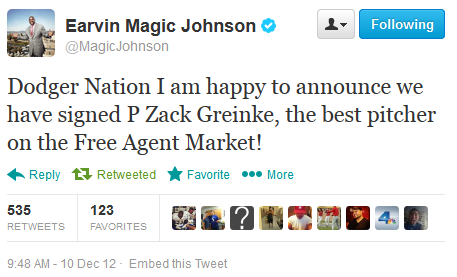 UPDATE: BTW, Magic Johnson just tweeted an announcement that the signing of Greinke is official. UPDATE II: It sounds like Magic Johnson jumped the gun here. According to Ken Gurnick at MLB.com, the deal is still pending a physical that is expected to be completed today. UPDATE IV: OK, this is my last try... dammit. I misspelled his first name. It's "Zack". You gotta love being around in our day and age. 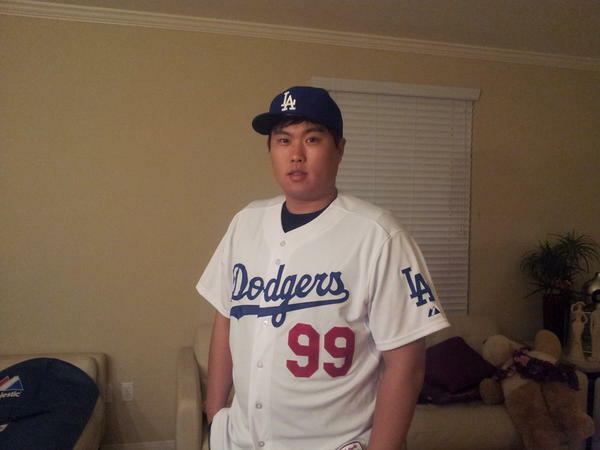 Within hours of finding out about the Dodgers signing Hyun-Jin Ryu we already have a couple of photos of him wearing Dodger Blue available to look at. 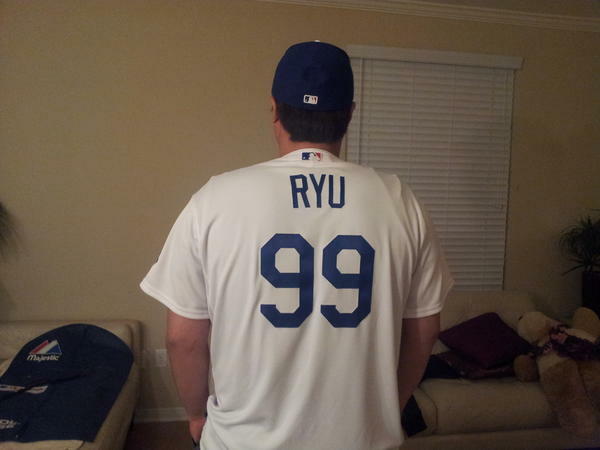 Tweeted last night by Ryu is himself in his new threads. 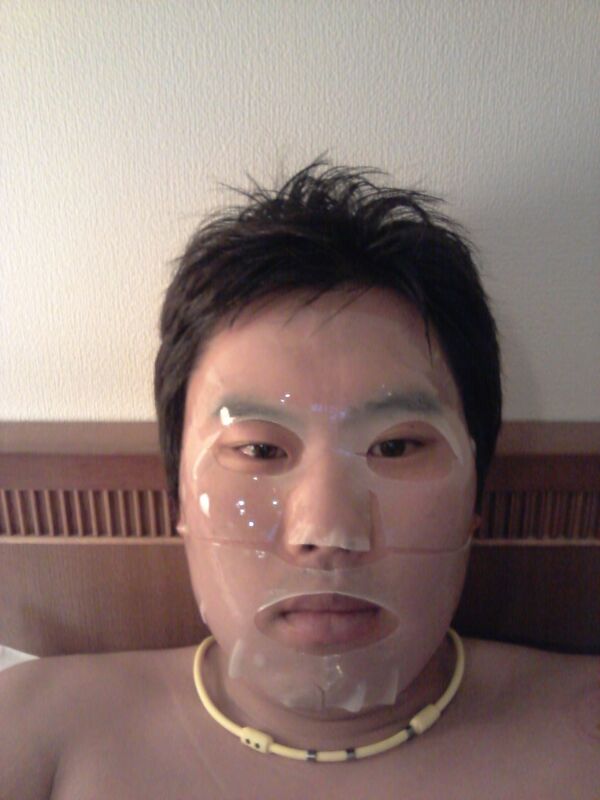 BTW, you can follow Hyun-Jin Ryu on twitter at @vrcjjongi. It's all in Korean, so unless you know the language it is likely not to be entertaining. Of course, sometimes you don't need to know what's being said to be entertained. You'll see what I mean in a moment. 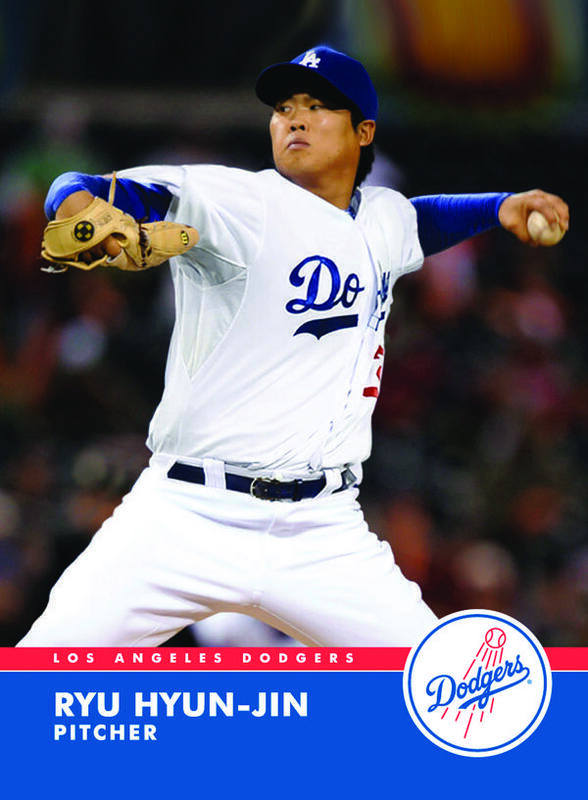 For now, check out the number Ryu will be wearing. He will be #99. As for being entertained when not understanding the language, check out the pic below. 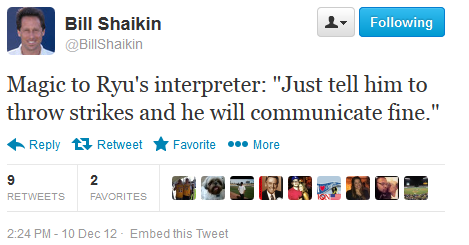 It was tweeted by Ryu 4 days ago, and I can't stop laughing. What the heck! ... and you know what? I still don't understand, and I'm still laughing. 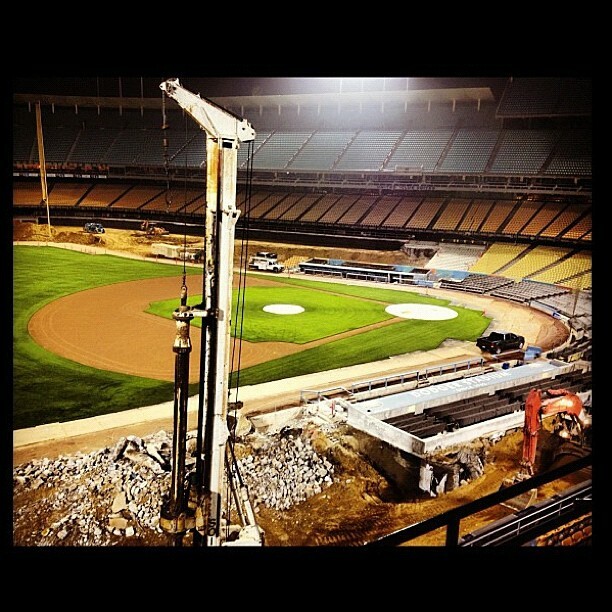 Take a look at Dodger Stadium now. Pic via twitter @DodgerPulse. This is all Matt Kemp had to say about the weekend. Via Richard Justice at MLB.com, New Dodgers Owners Prove They Mean Business. RIP, PJ Carey. He was a Dodger senior advisor for player development. Via Thomas Harding at MLB.com. Chad Moriyama reports that prospect Shohei Otani will sign with a Japanese team rather than join the MLB. Roberto at Vin Scully is My Homeboy notes that both Peter O'Malley and Vin Scully were at the Danny Kaye Centennial salute. Check out this great Baseball card quality fantasy card of Hyun-Jin Ryu tweeted by the @Dodgers below. And, since I couldn't help myself.... 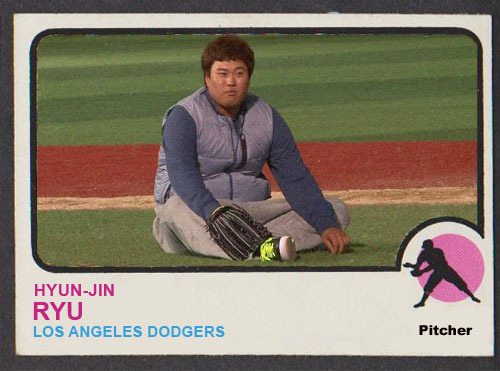 I decided to make another Ryu fantasy Baseball card, but a bit less glamorous. The pic was originally a screen grab from Shark Reborn that features Ryu when he was on a Korean game show.